370 Marlborough is located on the south side of Marlborough, between Hereford and Massachusetts Avenue, with 364 Marlborough to the east and 372 Marlborough to the west. 370 Marlborough was designed by Cabot and Chandler, architects, and built in 1880-1881 by Vinal & Dodge, masons, as the home of attorney William Cross Williamson and his wife, Sarah Howland (Ricketson) Williamson. He is shown as the owner on the original building permit application, dated October 27, 1880. Sarah Williamson purchased the land for 370 Marlborough on October 15, 1879, from Grenville T. W. Braman, Henry D. Hyde, and Henry M. Whitney, trustees of a real estate investment trust that had purchased several parcels of land on March 1, 1872, from the Boston Water Power Company. 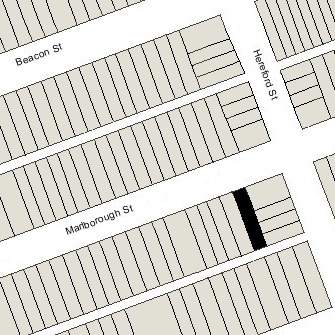 Click here for an index to the deeds for 370 Marlborough, and click here for further information on the land on the south side of Marlborough between Hereford and Massachusetts Avenue. By the 1881-1882 winter season, William and Sarah Williamson had made 370 Marlborough their home. They previously had lived at 98 Charles. William Williamson died in June of 1903. Sarah Williamson continued to live at 370 Marlborough until her death in January of 1916. 370 Marlborough was not listed in the 1917-1919 Blue Books. On July 17 1919, 370 Marlborough was purchased from Sarah Williamson’s estate by Fannie Stella (Rowe) Morrison, the wife of Dr. Lawrie Byron Morrison. They lived in Brookline. Lawrie Morrison was a pioneer radiologist, the founder of the radiology department at Deaconess Hospital. He had worked closely with Dr. Walter J. Dodd, the founder of the Massachusetts General Hospital radiology department, and they had maintained offices together, first at 205 Beacon and then at 374 Marlborough. The Morrisons converted 370 Marlborough into medical offices, and Lawrie Morrison moved his offices there from 374 Marlborough. By 1921, 370 Marlborough also was the residence of George McArthur (MacArthur) and his wife, Martha Ann (Tipping) McArthur. They had lived at 5 Brookline Avenue in 1920. He was an x-ray technician and also probably was caretaker for the building. They continued to live there until about 1939. At the time of the 1940 US Census, they were living in Braintree. In October of 1923, Dr. Morrison filed for (and subsequently received) permission to construct a two-story ell at the rear of the property. In the same application, he also sought (and received) permission to convert the property from a single-family dwelling into medical offices and a dwelling (legalizing what had been the use since 1920). By 1925, Dr. Sidney Leon Morrison, also a radiologist, maintained his medical office at 370 Marlborough. He was not closely related to Lawrie Morrison. Lawrie Morrison continued to maintain his offices at 370 Marlborough until his death in January of 1933, the victim of injuries resulting from his work with radiation. On July 1, 1940, Fannie Morrison transferred 370 Marlborough to their son, Dr. Harvey Rowe Morrison, a physician. He maintained his office there, along with Sidney Morrison and several other physicians. He and his wife, Leslie (Smith) Morrison, lived in Wellesley. 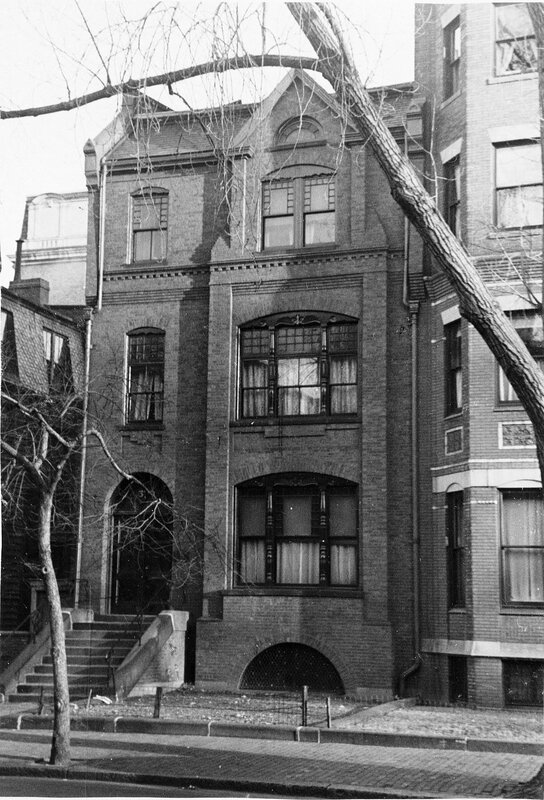 By 1940, the apartment at 370 Marlborough was the home of James Joseph Zinck and his wife, Mary E. (Keane) Zinck. She was a nurse at 370 Marlborough. They previously had lived at 92 Day. They continued to live at 370 Marlborough until about 1950. They were living in Billerica at the time of his death in August of 1951. 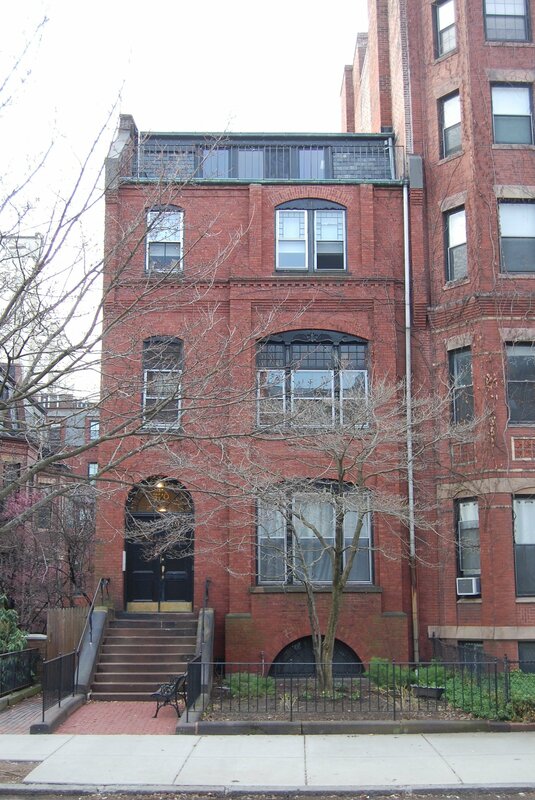 By about 1951, the apartment at 370 Marlborough was the home of Marion Irene (Wilson) Littlefield Brooks, the widow of Burton Clyde Littlefield and the former wife of Phillip Brooks. She was Harvey Morrison’s bookkeeper. She previously had lived at 409 Newbury. She married again in 1953 to Hugh Alexander Harbinson. They lived at 370 Marlborough until the mid-1960s. Sidney Morrison continued to maintain his office at 370 Marlborough until the late 1950s, and Harvey Morrison maintained his office there until the late 1960s. In June of 1968, Harvey Morrison filed for (and subsequently received) permission to convert the property from medical offices and a dwelling into seven apartments. On July 18, 1968, 370 Marlborough was purchased from Harvey Morrison by Pierre Louis de Bourgknecht. In August of 1968, he advised the Building Department of the sale and his intention to continue with the conversion of the property into seven apartments, the permit for which had been secured by Dr. Morrison. On July 1, 1985, 370 Marlborough was purchased from Pierre de Bourgknecht by Barry P. Winer and Paul G. Roiff, trustees of the 370 Marlborough Street Realty Trust. 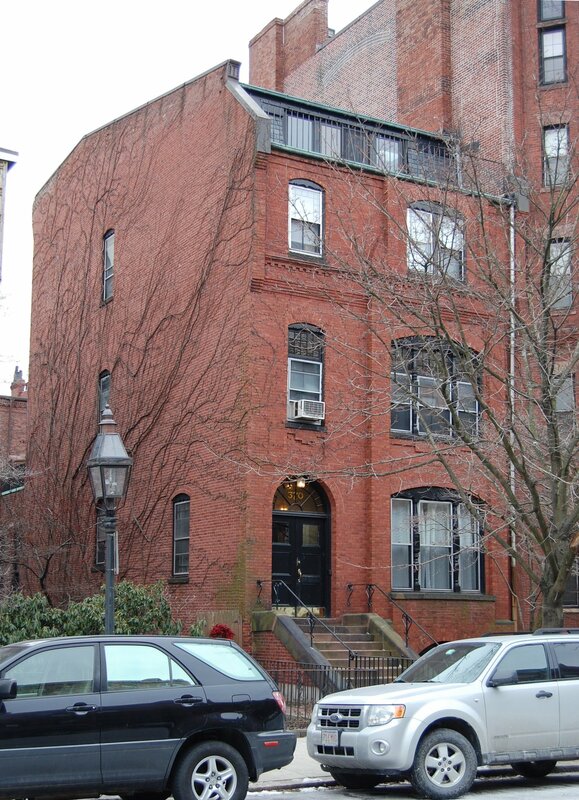 On September 24,1985, they converted the property into seven condominium units, the 370 Marlborough Street Condominium.